I love the idea of cooking. I enjoy the therapeutic image in my head of turning on music, throwing up my hair, and delving into a recipe full of slicing, dicing, and sautéing. But here's the cold hard truth. Dinner inconveniently occurs during witching hour at my house. 99% of the time there's a baby either in my arms or pulling my pants off because he's not while I'm prepping. Scouring Pinterest for new recipes usually makes me either want to eat cheesecake cookie dough brownie bars or bump my grocery budget up to $500 a week. And let's not even discuss the time I've spent preparing food that won't get eaten anyway. Needless to say, by December (aka the month that making the boys play outside while I make dinner is actually legitimately inhumane because it's both cold and dark), I was in a serious cooking rut. I had about 8 meals in my repertoire that I was cycling through and I wasn't excited about trying anything new. There's something about a big box of fresh simplicity delivered right to my door that made my heart sing. Dinner as I knew it was planned for the next 3 nights, with lunch leftovers to boot. 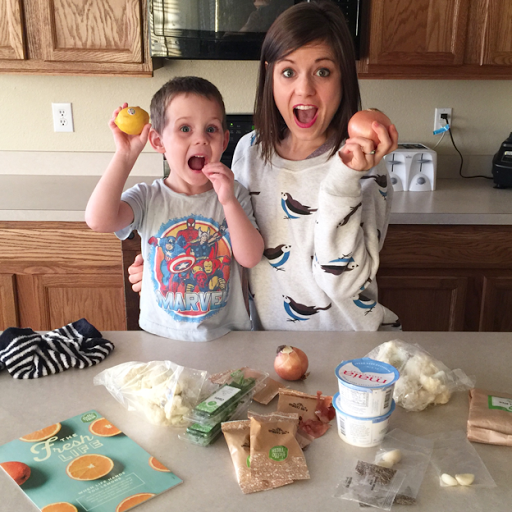 We tried the family box and the vegetarian box and both received rave reviews. And then there's the prep- the glorious prep. All the ingredients were perfectly portioned (I.e. I didn't have to purchase an entire bottle of sesame oil for the 2 teaspoons the recipe called for), the produce was in perfect condition, and the recipes gave clear, concise, step-by-step instructions for everything. 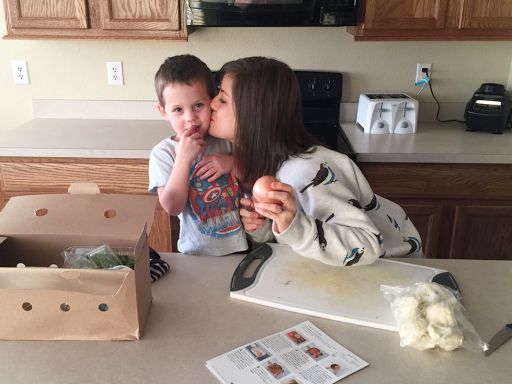 Milo and I love making dinner together and this made it so easy for him to help! The meals themselves were delicious. They were simultaneously kid-friendly and adult-friendly, and I felt so good about what I was feeding my people because it was healthy. full of produce, and I MADE IT. The best part of this experience was that having a week of simple-to-prepare, fresh meals gave me just the kick start I needed to break out of my dinnertime funk. It got me excited about cooking new things again! 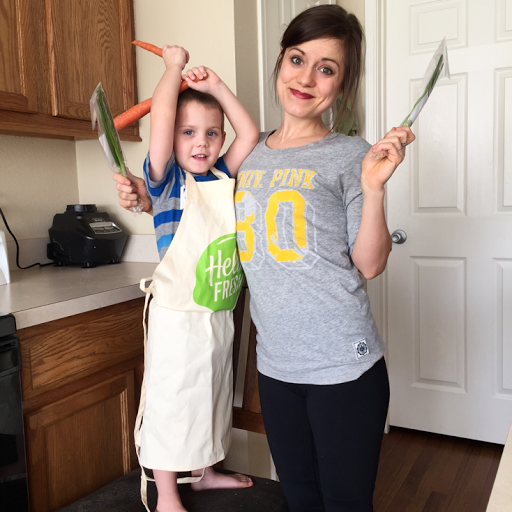 I would recommend Hello Fresh to anyone in need of a recharge in a heartbeat. Dinner prep with tiny kids is anything but a peaceful experience, and the only category we'd fall under is "hot mess". 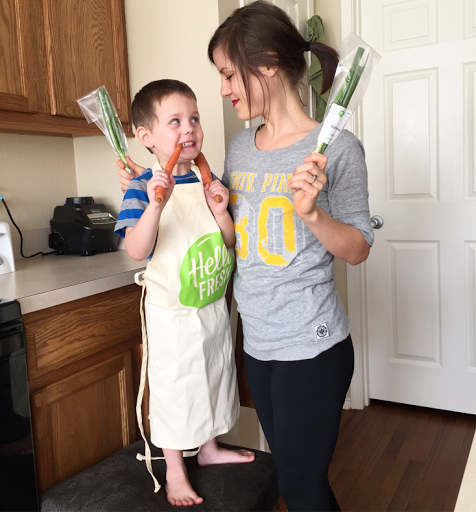 If your dinner reality is anything like mine, try Hello Fresh! Give yourself some grace, let dinner be simple for a week, and then take a deep breath and search the Hello Fresh site for recipes instead of Pinterest because unfortunately cheesecake cookie dough brownies for dinner are frowned upon for some odd reason ;).